Choosing the right chorizo in my opinion is the most important part of this recipe. I usually like the ground uncooked stuff, but certain brands of the cured/smoked kind are tasty too. Some brands are a little too smokey/sweet and come off hammy to me. Cook the chorizo to brown it (whether it is already cooked or not). Remove the thick stems from the kale and rip the leafy parts into small pieces. Shred half the pepperjack and combine with crumbled queso. Slice the other half of the pepperjack into thin slices. Broil the poblano peppers for a few minutes turning and moving around constantly to slightly char parts of the skin and soften them up a bit. Using a paring knife, remove the stem from the peppers and shake out the seeds and insides. Slice the chicken the long way to make thin cutlets. You may want to also pound these out to thin them further. Depending on the size of the chicken breasts, this will be 2 or 3 cutlets per breast. Top the cutlets with chorizo, kale, and cheese. Roll the cutlets up and stuff them into the poblano peppers. Try and match smaller peppers with smaller cutlets. Also don't worry if some rip! Practice makes perfect and we can hide those rips with cheese later. Bake at 350°F for about 45 minutes until fully cooked. Top with the slices of pepperjack and broil until browned. 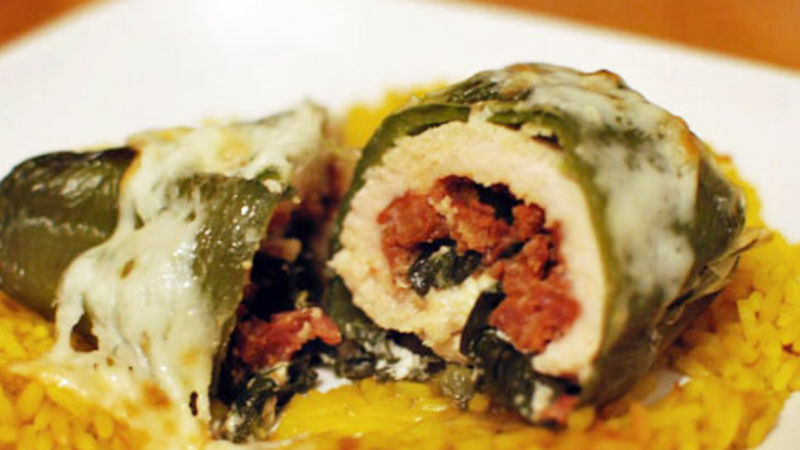 Here's how I got this idea: in the past I have had an Italian version--a spinach and provolone stuffed chicken breast stuffed in a red bell pepper. I decided to make it Mexican by using some Spanish sausage and Mexican peppers and cheese. The results were fantastic--deemed better than the Italian version by a friend who has happily enjoyed both. This recipe is fairly easy and has many fewer ingredients than most of my recipes. The most important factor is getting the right chorizo. Chorizo can make or break a dish, and I have had some really bad versions! Some of the bad kinds are overly smoky and sweet and come off a bit hammy. The good kinds have a bacon-y smoke quality with a deep savory spice. I have never gone wrong with the raw kind found in casings, but as for the cured and smoked kinds, it really is a matter of trying a few brands and seeing what you like. I have had more luck with some of the Portuguese brands at my local grocery store. The stuffings. I cooked the chorizo to brown it even though it was already cooked. The kind I got was pre-cooked but ground. When it was done browning, I drained some of the fat from it. The poblano peppers. It was tough to find 10 of these at the store that looked suitable for stuffing, but luckily they had enough that day. Chorizo on the chicken first. The chicken was sliced the thin way, then pounded slightly to make them thinner. You get about 2 - 3 cutlets per breast. Kale and cheese go next. This is a mix of queso blanco and Monterey Jack. Rolled up and ready to stuff. Sometimes it was tough getting these into the peppers. Make sure you use the smaller chicken to stuff into the smaller peppers and vice versa. Not so perfect! Not a big deal though. You can hide it with cheese later. After they baked about 45 minutes, the cheese went on. After broiling, they were golden delicious. When you see this on the plate in front of you, you just want to dig in! Even if you don’t know there is delicious chorizo waiting for you. Super tasty. Smoky, savory, a slight kick, this is a perfect fall comfort meal after a chilly day! Dan Whalen sleeps stuffed inside a huge poblano pepper every night. Check out his blog at The Food in my Beard; check Dan's Tablespoon profile often to try his recipes with creative international spins!